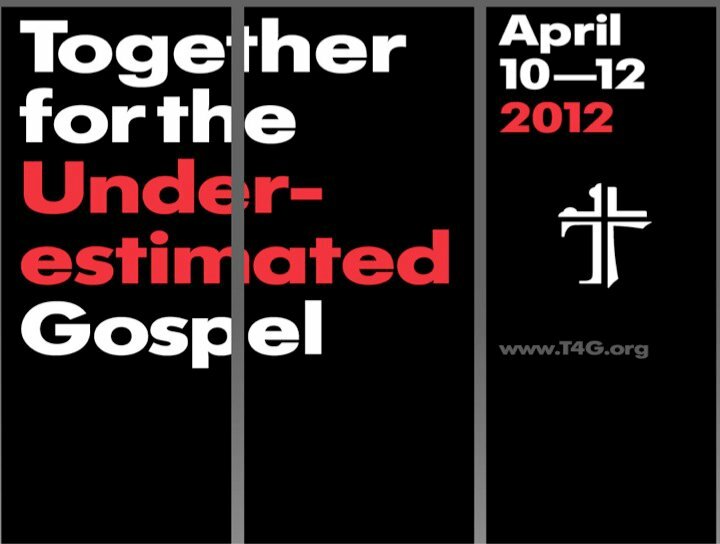 Reflections on T4G 2012 | WHATEVER! I returned home Friday afternoon from Together for the Gospel 2012, held in Louisville, KY. It was a remarkable week, and Lord willing and if the resources are available, I am looking forward to attending the conference again in 2014, and this time taking Leigh with me, if she is interested. This was the first time I have attended a T4G conference, although I have been aware of the conferences since 2008 which was the second time it was held, the first being in 2006. For anyone unfamiliar with T4G, this page gives a brief background on its origins and also an entry into their website where more information can be found about this year’s conference. In brief, T4G is a biennial conference held primarily for pastors, but others do and may attend. However, since it is targeted to pastors, lay persons may find the topics and the vocabulary a rung or two higher than would be found at conferences aimed primarily at the laity. While it is a bit of a strained analogy from the outset and breaks down on many levels, T4G could be thought of as for pastors, what Passion is for college students. Following are a few reflections on my experience in Louisville this past week. General Sessions There were 9 General Sessions, each with a different man giving the session message. By virtually any definition, each of these men would be considered a “celebrity pastor.” And that description is not meant to be disparaging, but instead to state that each is well-known beyond the sphere of their primary pastoral responsibility. The T4G founding four (Al Mohler, Mark Dever, CJ Mahaney, and Ligon Duncan) all delivered messages in the general sessions. Conference regular Thabiti Anyabwile also presented, but because of conflicts, John MacArthur and RC Sproul could not attend this year. In their place, David Platt, Matt Chandler and Kevin DeYoung were included among the general session presenters. Each delivered excellent messages, all focusing in one way or another on the sovereignty of God. It was my opinion, confirmed by others since the conference that David Platt is the one who may have delivered the Grand Slam of all General Session messages. It was remarkable in many ways and can be watched here. Singing Each General Session was initiated with congregational singing. And this preparation for worship was nothing short of amazing. The songs were either traditional hymns, or contemporary songs which for the most part are the product of Sovereign Grace Music. Bob Kauflin from SGM led this singing and the only musical instrument was a Steinway grand piano. Another thing that was remarkable was the singing in an octave (if that is the right word) that suited men, who represented probably 98% of the attendees of the conference. And 7,500 +/- men singing together was really quite impactful. The other thing that struck me was that the songs were without exception more theological than the usual “love songs for a savior” that have become so popular in recent years. The distinction being that most if not all of the songs that were sung at T4G were expressions of the Gospel, which is God’s love song for sinners. Oh, Brother I am evidently more “Presbyterian” than even I thought, although this may not come as a great surprise to others. I don’t recall another 3 day period of time, ever, when I have heard the word “brother” or been referred to as “Brother” more than I did between April 10 and 12. I get that it is supposed to be an affirmation of our common position with other believers in Christ, but for me, a little of it goes a long way. On some level its welcome was a bit worn out, not unlike how the term “dude” wears a bit thin. Attendees At the beginning of the conference, an informal demographic analysis was done by asking people to stand up, or remain standing as various criteria were set out. Naturally, a great many were pastors, or on church staffs. Attendees were of all ages from, 8 (sons of attendees, probably home schoolers) to in their 80’s. Folks were from all over the world, with Malaysia and New Zealand being among the furthest distances. And it was acknowledged that there were more women in attendance, although it is worth mentioning that none were pastors, although that certainly would have been newsworthy and would have created an interesting dynamic for the panel discussion on complementarianism. Fanatics I was actually quite surprised and bewildered by the number of young men in attendance who I would describe almost as groupies. After each General Session message, they crowded the front of the arena floor seating area trying to get autographs from any the 9 presenters and photos of themselves with said presenter at the same time. What was most unsettling was their requests that the presenters sign their Bibles. It just seemed a bit odd. I always think of authors signing the books they have written. I was not alone in my bewilderment that this was happening. I have to wonder if the profile of T4G attendees has changed to this, or if the fanatics have always attended. The good news is that the VAST majority of attendees were content to simply let the messages delivered by the presenters be their take-away from the conference. Welcome to their world! The men attending T4G had a little taste of what women go through in most public places. There were vastly too few restrooms for the number of men in attendance at the KFC Yum Center. The solution was to dedicate some of the women’s restrooms to the use of men. What was a bit disconcerting was the fact that the conference was nearly 2/3 over before the organizers saw fit to bring about this remedy. How disconnected were they from the regular conference attendee to have not been able to see the lines form at each break between sessions? Peretti should write about this. The irony is rich that the headquarters of the Presbyterian Church (USA) is located directly across the street from the KFC Yum Center where T4G was held with literally thousands of Reformed pastors in attendance. PCUSA is a dying denomination as a result of its questioning the veracity of scripture, the Lordship and exclusivity of Christ’s atonement unto salvation, and most recently abandoning historic orthodoxy with respect to the normalization of homosexual behavior for its elders. I can imagine that there was plenty of activity in the spiritual realm and Frank Peretti has a skill for bringing this out in his novels. The Up and Comers Three of the General Session speakers are “young men”, at least relatively speaking. But the founders of T4G openly affirmed them as guys for whom they have a great deal of confidence and feel good about entrusting the future of American Reformed evangelicalism. And each of these three guys is the pastor of the kind of church that many new church planters hope to someday lead. One of the things that struck me was that each of these three are regularly clean-shaven and none had any tattoos (at least none that were visible). Draw your own conclusions. But no matter how you land on these clearly and undeniably debatable matters, I would just say that there is very a thin line between contextualization and syncretism. But that can be the subject of another post. Grateful While I know that none of the organizers of T4G will read this post, I do want to say that I am grateful for their efforts in putting together and executing the conference. And I am grateful to Leigh who took care of things at home while I was away. And I am grateful that I was chosen before the foundations of the world to be holy and blameless before him, adopted according to the purpose of his will to the praise of his glorious grace. This entry was posted on Saturday, April 14th, 2012 at 10:45 pm and is filed under Matters of Faith. You can follow any responses to this entry through the RSS 2.0 feed. You can leave a response, or trackback from your own site. Thanks for posting your reflections! It was my first time at T4G as well, and I can relate with you on a lot of your thoughts (humorous, but true – I can relate about being too Presbyterian and not hearing the word “brother” as much as I did last week!). Thanks again for posting, and it was a joy to worship with you and several thousand “brothers” last week. I was in attendance to and agree with all of your reflections. I found it to be very pastoral and penetrating. Not necessarily stuff that I didn’t know, but it confirmed, encouraged and affirmed convictions that I already share. I needed the time under the word and was grateful for the reminder in many forms of the glorious Godpel I have been the recipient of and the Sovereign God I serve. I took two men from my church and my 18 year old Son. Our debrief discussions in our Hotel room were worth the trip.